New toys for the coming year…. The above is a link to a series of pictures from Nuremberg Toy Fair- a good glimpse to what the major manufacturers are going to release in the forthcoming year. In other news my posts may be a little less frequent as the good/ bad news is I’m back to being a spoddy student. In any case I’ve still been playing games and have a bit of a backlog of game pics to post. 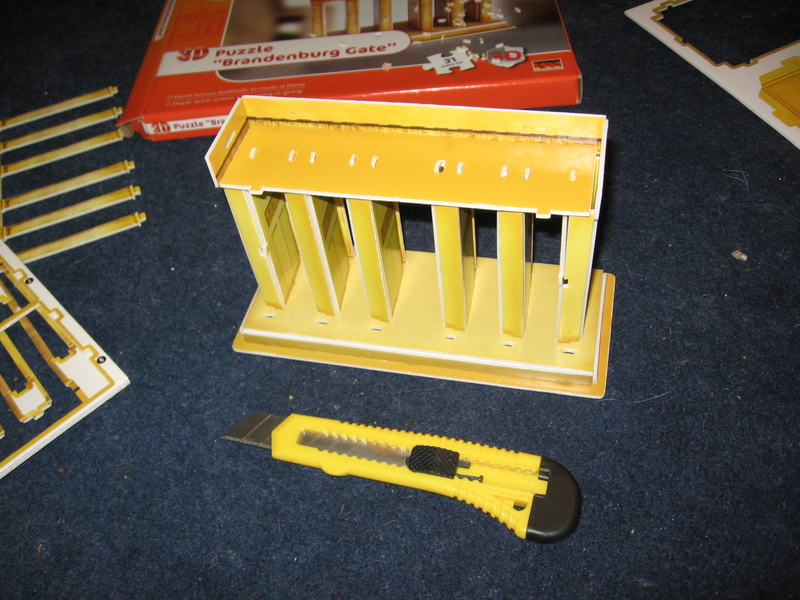 Brandenburg Gate: On the cheap. They say if you are wanting to make something you can a) have it quick, b) have it cheap or c) have it good, however you can only have two of the three options…. 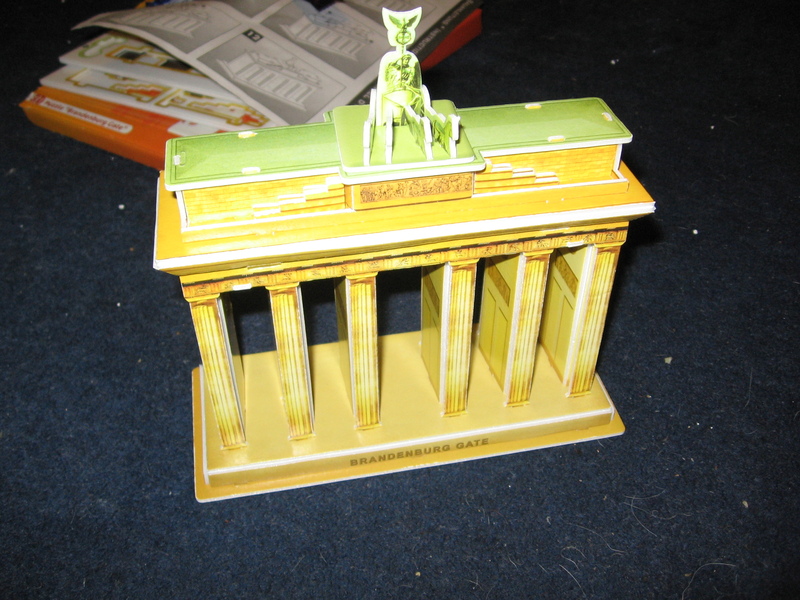 A good while back Britannia Miniatures released a 20mm sized replica of the Brandenburg Gate from Berlin, sadly Dave Howit, the founder of Britannia has passed; thankfully the reins have subsequently been passed to the more than capable Andy Grubb. However I’ve heard that to get the old model back into production is prohibitively expensive…. How do these two statements relate to each other? 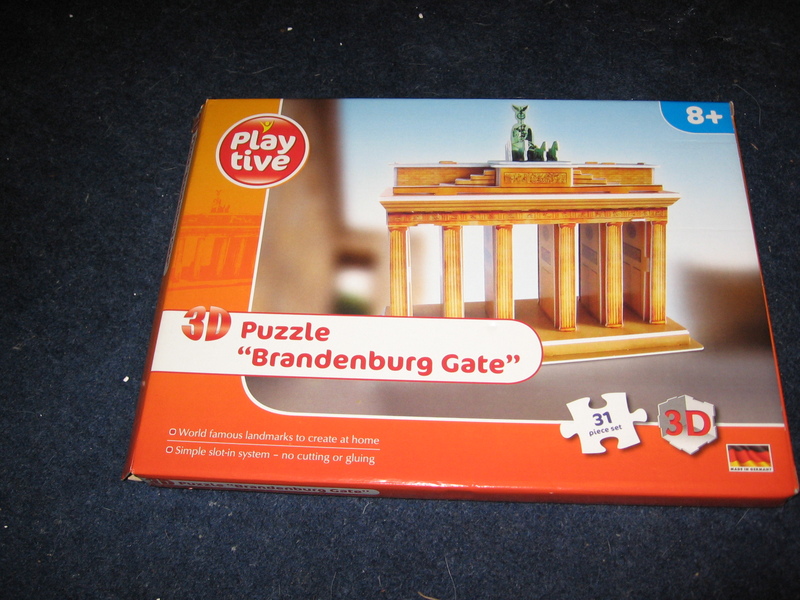 Well I was grabbing some food on my way home from town and popped into the well known Lidl supermarket where I found a card model of the Brandenburg Gate for £2.99. It seemed too good to pass up for the price, as such it meets the first two options from the first sentence. 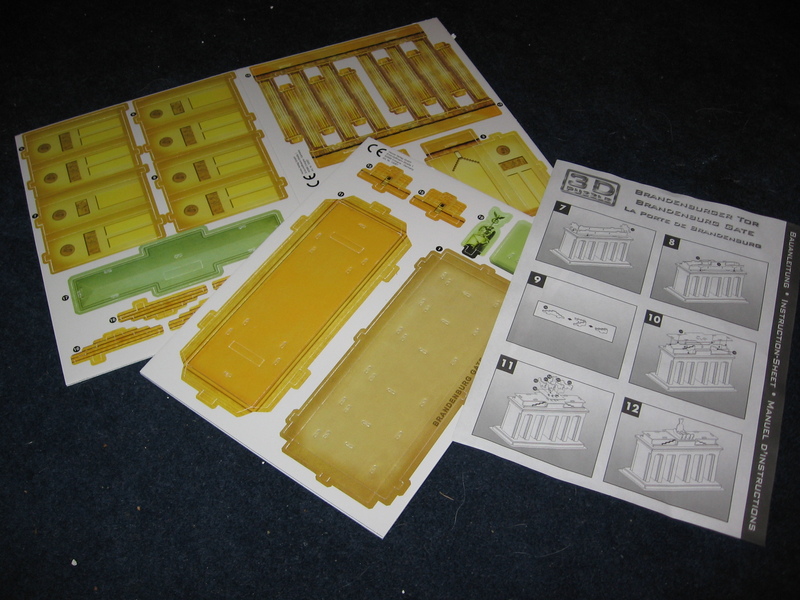 The parts come on foam core that has been printed on both sides, 2 A3 sheets. Although described as a puzzle it came with 2 side of instructions. Construction is simple- pop out fold and then push together. 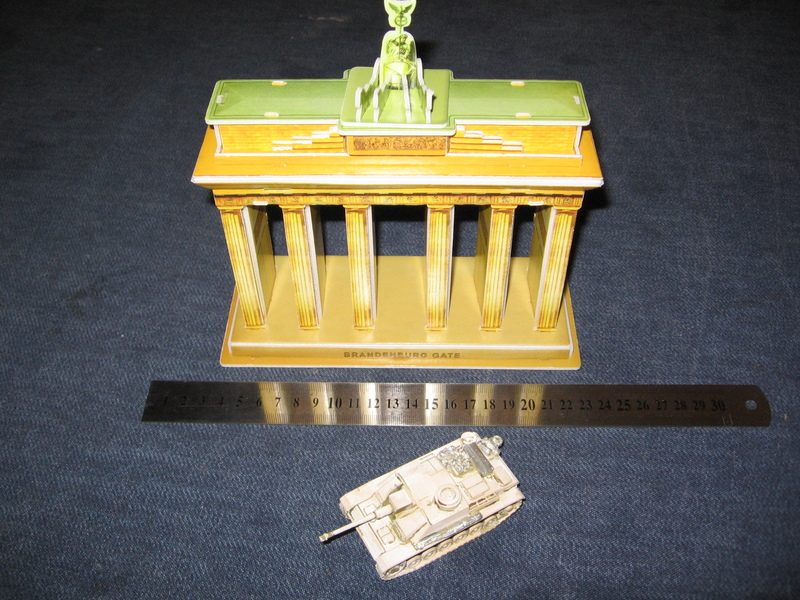 With a 30cm ruler and 1/72 Armourfast STUG for scale purposes. I’ll be honest it is far from perfect- rather crude and at a rough guesstimate about half the size it should be. It was quick and cheap though and will be more in tune to the ground, rather than the figure scale. If I can be bothered I’ll paint the exposed edges, if I can really be bothered I’ll replace the weakest element (the chariot at the top) with a metal model, and if a huge burst of energy overtakes me I can always use it as a template to scale up and scratch-build a true 1/76 scale one. In any case I can see myself using it a Berlin skirmish soon. 2014 projects- a few ideas. Given that it is the start of the year I thought I’d best outline my hobby plans for the forthcoming 12 months. Perhaps making the ideas floating in my brain tangible (as much as anything is tangible on the net) might help me do more; much as the quarterly progress reports have massively upped my productivity. An that topic: a quick glance at 2012 stats shows I was marginally less productive in the last year (only by 10%), either way it gives me a figure to aim for. Anyway enough dry stats… first thing that comes to mind is to finish my writing project ASAP (I’ll be honest I have been procrastinating on it, to the point of avoiding other things, bad of me I know). With regards to figures I’ve ordered some Zulu 1/72 plastic. I really enjoyed the game that Evan put on a bit ago so I decided to get some of my own to add to his collection, hopefully it will be a catalyst to game some more. My plan is to get 1 15 figure unit of Natal Native Horse, 1 20 man British infantry unit and 3 20 man Zulu units. Being as it will all be in plastic it shouldn’t break the bank either. With the numbers it should only be a couple of months painting time too. As I’ve got enough Soviet figures I’ve decided to get the relevant Italian forces to play the games through. A list has been made and I plan to pick up the figures at the next show I get to. As I’ve got more 20mm WW2 figures than I need for skirmish purposes I’m aiming to get them based up for higher (command) level games- namely Blitzkrieg Commander and Megablitz. Finally: I got a copy of the book ‘Shanghai 1937: Stalingrad on the Yangtze’. I’m sure that this will be interesting as I’ve read a bit on the city already, their police force was surprisingly far sighted, and it was the childhood home of one JG Ballard. Either way given the circular way my interest in gaming and history works I’ll end up wanting to explore the era in miniature form, again I think that more plastics will be obtained with a few choice metal addition. As a side note if anyone can recommend a good 20mm sized Japanese command pack that isn’t just made up of myopic sword waving officers it would be most appreciated; sadly the companies that I’ve looked at have had a very limited imagination when it comes to depicting them. Officers planning round a table would be ideal. Still if I did get a Japanese force it could quite easily fight my existing Soviet collection in either ’30 or ’45, see it is all circular…. painted 124 20mm figures, painted 20 20mm kits and read 22 books. Thus the years total are: 533 20mm figure painted, 60 20mm kits finished (sadly I didn’t look at anything in any other scales) and 107 books read. All that remains of the year is to thank my friends, followers and readers and wish you a Happy New Year.